We just completed our Valentines for Thursday, ahead of schedule! I’d love to claim credit for the idea, but I got it from Pinterest. We had an abundance of Hot Wheels cars, both new and very gently (read: never) used, so we were able to put this together very inexpensively. 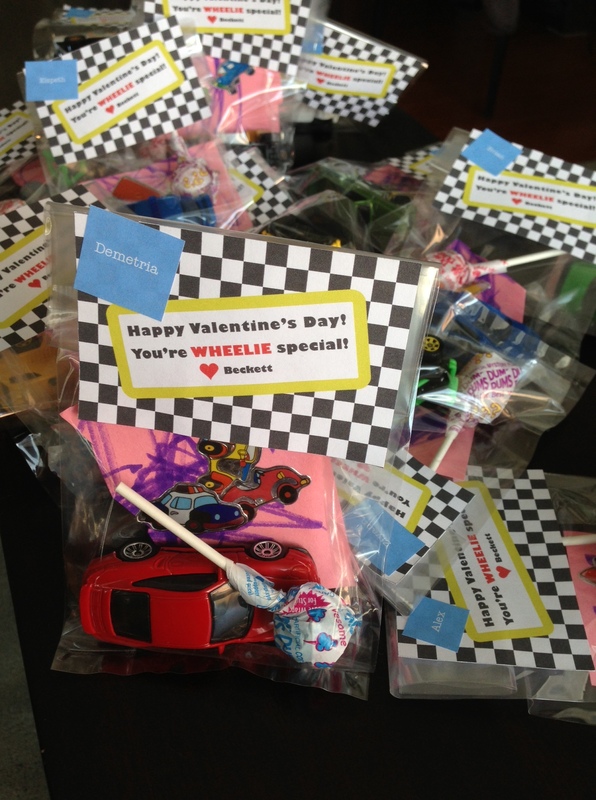 Each clear favor bag contains a card, a lollipop, and a car. My son made paper valentines for his friends on construction paper by diligently coloring, cutting, and applying stickers. It cracked me up that he chose the two police cars for his besties! I was really proud of his giving spirit and his ability to focus…my little guy is growing up so fast. I suspect we’ll be making more paper Valentines for neighbors this week. If you’re a neighbor, expect some scribbles under your door for the next few days! I LOVE your website & blog! Good job!